I hate answering “how are you?” because the answer is typically “crap”, but the bummer for the asker is a bigger bummer for me who lives it. Yes, others have it worse. Others share similar stories. This is just one small story of one small day. No advice please. Do not make a single suggestion. Tweet me @antheaw or read more about my health starting here: The problem with my head, or just the #health tag. I have used my most coveted pain relief concoction for four out of the last five days. That’s more than I usually resort to within an entire month. This list excludes vitamins, contraceptives, a digestive aid I sometimes need to prevent constipation, and additional occasional (i.e not everyday) medications. I played a little Minecraft on Xbox, got cold and too sore, returned to bed around 8:30am, and slept until midday when my guest also got up (they are on a different timezone, different body clock). They made me poached eggs, I ate two and a slice of toast. My stomach could handle that, just, followed by some tea and a return to the couch. In the dark. It was a beautiful day outside but the glaring New Zealand sun sears my eyes and feels as though it fries my brain. I researched online streaming, gaming, watched some streamers, played more Minecraft. At least within the game it feels as though I am making progress, and it takes my mind off of so many things until my pain becomes too much again. Late afternoon, my guest went to walk in the lovely park across the road from my house. I was in too much main to go, and the idea of doing so was awful. It used to make me feel good to do that. Alone I stretched, some yoga type moves, working with my body weight to trigger my weakened muscles. After more sleep, which is excellent pain avoidance, I showered in the hopes of feeling normal for my partner returning home from work and my friend from their walk. This was quite an achievement, to shower and wash my hair, dress in clean clothes and get to the couch in one burst of energy and pain. Tolerable for long enough to complete that set of tasks. It’s impossible to overstate how hard a shower can be, not just for me. By the time everyone returned to the house I was adamant I could do no more. No more. And yet. From leftovers of two previous nights and various pantry staples I invented dinner, and made a disastrous mess of the kitchen. I didn’t need the food, and I’m finding it hard not to feel or to show resentment for having to provide a meal. My partner loves to cook and often will take over. There was really no energy left for me to clean up. The only person I was letting down by allowing the kitchen to stay a mess overnight is me. My Mum always cleans her kitchen before bed, even after a party. I watched TV with my guest and relaxed, I finally started to feel a bit better as often happens at night. My mind off the pain, I enjoyed her company and the show before everyone left for bed while I wanted to savour feeling ok. 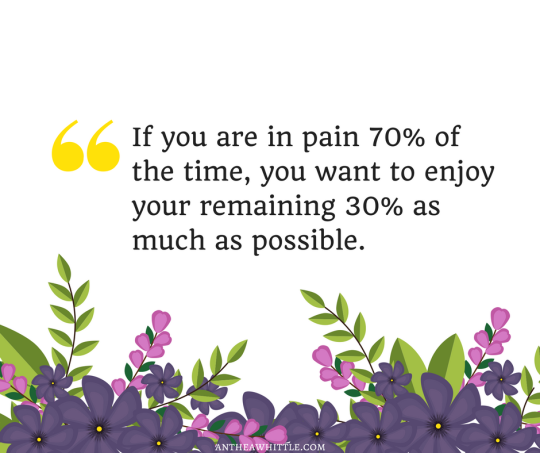 If you are in pain and feel horrible 70% of the time, you want to enjoy the remaining 30% of your time as much as possible. I get too excited though, many of the things that I might like to do could set me back to feeling horrendous so, I can enjoy, but have to take it easy. Bed again, my favourite place in the world but also the last place I would like to be sometimes. Three hours sleep until my partner wakes for work, my cat wedged against my other side, witness to my day. Are we the worst kind of web user?